The latest developments in cosmology point toward the possibility that our universe is merely one of billions. That’s how Albert Einstein, in his characteristically poetic way, asked whether our universe is the only possible universe. The reference to God is easily misread, as Einstein’s question wasn’t theological. Instead, Einstein wanted to know whether the laws of physics necessarily yield a unique universe—ours—filled with galaxies, stars, and planets. Or instead, like each year’s assortment of new cars on the dealer’s lot, could the laws allow for universes with a wide range of different features? And if so, is the majestic reality we’ve come to know—through powerful telescopes and mammoth particle colliders—the product of some random process, a cosmic roll of the dice that selected our features from a menu of possibilities? Or is there a deeper explanation for why things are the way they are? In Einstein’s day, the possibility that our universe could have turned out differently was a mind-bender that physicists might have bandied about long after the day’s more serious research was done. But recently, the question has shifted from the outskirts of physics to the mainstream. And rather than merely imagining that our universe might have had different properties, proponents of three independent developments now suggest that there are other universes, separate from ours, most made from different kinds of particles and governed by different forces, populating an astoundingly vast cosmos. So which is it? And why should we care? Grasping the answer requires that we first come to grips with the big bang. In 1915, Einstein published the most important of all his works, the general theory of relativity, which was the culmination of a 10-year search to understand the force of gravity. The theory was a marvel of mathematical beauty, providing equations that could explain everything from the motion of planets to the trajectory of starlight with stupendous accuracy. Within a few short years, additional mathematical analyses concluded that space itself is expanding, dragging each galaxy away from every other. Though Einstein at first strongly resisted this startling implication of his own theory, observations of deep space made by the great American astronomer Edwin Hubble in 1929 confirmed it. And before long, scientists reasoned that if space is now expanding, then at ever earlier times the universe must have been ever smaller. At some moment in the distant past, everything we now see—the ingredients responsible for every planet, every star, every galaxy, even space itself—must have been compressed to an infinitesimal speck that then swelled outward, evolving into the universe as we know it. The big-bang theory was born. During the decades that followed, the theory would receive overwhelming observational support. Yet scientists were aware that the big-bang theory suffered from a significant shortcoming. Of all things, it leaves out the bang. Einstein’s equations do a wonderful job of describing how the universe evolved from a split second after the bang, but the equations break down (similar to the error message returned by a calculator when you try to divide 1 by 0?) when applied to the extreme environment of the universe’s earliest moment. The big bang thus provides no insight into what might have powered the bang itself. In the 1980s, physicist Alan Guth offered an enhanced version of the big-bang theory, called inflationary cosmology, which promised to fill this critical gap. The centerpiece of the proposal is a hypothetical cosmic fuel that, if concentrated in a tiny region, would drive a brief but stupendous outward rush of space—a bang, and a big one at that. In fact, mathematical calculations showed that the burst would have been so intense that tiny jitters from the quantum realm would have been stretched enormously and smeared clear across space. Like overextended spandex showing the pattern of its weave, this would yield a precise pattern of miniscule temperature variations, slightly hotter spots and slightly colder spots dotting the night sky. In the early 1990s, NASA’s Cosmic Microwave Background Explorer satellite first detected these temperature variations, garnering Nobel Prizes for team leaders John Mather and George Smoot. Remarkably, mathematical analysis also revealed—and here’s where the multiverse enters—that as space expands the cosmic fuel replenishes itself, and so efficiently that it is virtually impossible to use it all up. Which means that the big bang would likely not be a unique event. Instead, the fuel would not only power the bang giving rise to our expanding realm, but it would power countless other bangs, too, each yielding its own separate, expanding universe. Our universe would then be a single expanding bubble inhabiting a grand cosmic bubble bath of universes—a multiverse. It’s a striking prospect. If correct, it would provide the capstone on a long series of cosmic reappraisals. We once thought our planet was the center of it all, only to realize that we’re one of many planets orbiting the sun, only then to learn that the sun, parked in a suburb of the Milky Way, is one of hundreds of billions of stars in our galaxy, only then to find that the Milky Way is one of hundreds of billions of galaxies inhabiting the universe. Now, inflationary cosmology was suggesting that our universe, filled with those billions of galaxies, stars, and planets, might merely be one of many occupying a vast multiverse. Yet, when the multiverse was proposed back in the 1980s by pioneers Andrei Linde and Alexander Vilenkin, the community of physicists shrugged. The other universes, even if they existed, would stand outside what we can observe—we only have access to this universe. Apparently, then, they wouldn’t affect us and we wouldn’t affect them. So what role could other universes possibly play in science, a discipline devoted to explaining what we do see? And that’s where things stood for about a decade, until an astounding astronomical observation suggested an answer. Although the discovery that space is expanding was revolutionary, there was one aspect of the expansion that most everyone took for granted. Just as the pull of earth’s gravity slows the ascent of a ball tossed upward, the gravitational pull of each galaxy on every other must be slowing the expansion of space. In the 1990s, two teams of astronomers set out to measure the rate of this cosmic slowdown. Through years of painstaking observations of distant galaxies, the teams collected data on how the expansion rate of space has changed over time. And when they completed the analysis, they all nearly fell out of their chairs. Both teams found that, far from slowing down, the expansion of space went into overdrive about 7 billion years ago and has been speeding up ever since. That’s like gently tossing a ball upward, having it slow down initially, but then rocket upward ever more quickly. The result sent scientists across the globe scurrying to explain the cosmic speedup. What force could be driving every galaxy to rush away from every other faster and faster? The most promising answer comes to us from an old idea of Einstein’s. We’re all used to gravity being a force that does only one thing: pull objects toward each other. But in Einstein’s general theory of relativity, gravity can also do something else: it can push things apart. How? Well, the gravity exerted by familiar objects like the moon, the earth, and the sun is surely attractive. But Einstein’s equations show that if space contains something else—not clumps of matter but an invisible energy, sort of like an invisible mist that’s uniformly spread through space—then the gravity exerted by the energy mist would be repulsive. Which is just what we need to explain the observations. The repulsive gravity of an invisible energy mist filling space—we now call it dark energy—would push every galaxy away from every other, driving the expansion to speed up, not slow down. At the same time, attempts by researchers to calculate the amount of dark energy from the laws of physics have yielded results that are typically a hundred orders of magnitude larger, perhaps the greatest mismatch between observation and theory in the history of science. And that has led to some soul searching. Physicists have long believed that with sufficient hard work, experimentation, and industrious calculation, no detail about the fundamental makeup of reality would lie beyond scientific explanation. Certainly, many details still lack an explanation, such as the masses of particles like electrons and quarks. Yet the expectation has been that in due course physicists will find explanations. The spectacular failure of attempts to explain the amount of dark energy has raised questions about this confidence, driving some physicists to pursue a radically different explanatory approach, one that suggests (once again) the possible existence of a multiverse. The new approach has scientific roots that stretch back to the early 1600s, when the great astronomer Johannes Kepler was obsessed with understanding a different number: the 93 million miles between the sun and the earth. Kepler struggled for years to explain this distance but never succeeded, and from our modern perch the reason is clear. We now know that there are a great many planets, orbiting their host stars at a great many different distances, demonstrating the fallacy in Kepler’s quest—the laws of physics do not single out any particular distances as special. Instead, what distinguishes the earth-sun distance is simply that it yields conditions hospitable to life: were we much closer or farther from the sun, the extreme temperatures would prevent our form of life from taking hold. So, although Kepler was on a wild goose chase in seeking a fundamental explanation for the earth-sun distance, there is an explanation for why we humans find ourselves at such a distance. In seeking an explanation for the value of dark energy, maybe we’ve been making a mistake analogous to Kepler’s. Our best cosmological theory—the inflationary theory—naturally gives rise to other universes. Perhaps, then, just as there are many planets orbiting stars at many different distances, maybe there are many universes containing many different amounts of dark energy. If so, asking the laws of physics to explain one particular value of dark energy would be just as misguided as trying to explain one particular planetary distance. Instead, the right question to ask would be: why do we humans find ourselves in a universe with the particular amount of dark energy we’ve measured, instead of any of the other possibilities? This is a question we can address. In universes with larger amounts of dark energy, whenever matter tries to clump into galaxies, the repulsive push of the dark energy is so strong that the clump gets blown apart, thwarting galactic formation. In universes whose dark-energy value is much smaller, the repulsive push changes to an attractive pull, causing those universes to collapse back on themselves so quickly that again galaxies wouldn’t form. And without galaxies, there are no stars, no planets, and so in those universes there’s no chance for our form of life to exist. And so we find ourselves in this universe and not another for much the same reason we find ourselves on earth and not on Neptune—we find ourselves where conditions are ripe for our form of life. Even without being able to observe the other universes, their existence would thus play a scientific role: the multiverse offers a solution to the mystery of dark energy, rendering the quantity we observe understandable. Or so that’s what multiverse proponents contend. Many others find this explanation unsatisfying, silly, even offensive, asserting that science is meant to give definitive, precise, and quantitative explanations, not “just so” stories. But the essential counterpoint is that if the feature you’re trying to explain can and does take on a wide variety of different mathematical values across the landscape of reality, then seeking a definitive explanation for one value is wrongheaded. Just as it makes no sense to ask for a definitive prediction of the distance at which planets orbit their host stars, since there are many possible distances, if we’re part of a multiverse it would make no sense to ask for a definitive prediction of the value of dark energy, since there would be many possible values. The multiverse doesn’t change the scientific method or lower explanatory standards. But it does ask us to reevaluate whether we’ve mistakenly posed the wrong questions. Of course, for this approach to succeed, we must be sure that among the multiverse’s many different dark-energy values is the very one we’ve measured. And that’s where a third line of investigation, string theory, comes to the fore. String theory is an attempt to realize Einstein’s dream of a “unified theory” capable of stitching all matter and forces into a single mathematical tapestry. Initially formulated in the late 1960s, the theory envisions that deep inside every fundamental particle is a tiny, vibrating, stringlike filament of energy. And much as the different vibrational patterns of a violin string yield different musical notes, so the different vibrational patterns of these tiny strings would yield different kinds of particles. Pioneers of the subject anticipated that string theory’s rigid mathematical architecture would soon yield a single set of definitive, testable predictions. But as the years passed, detailed analysis of the theory’s equations revealed numerous solutions, each representing a different possible universe. And numerous means numerous. Today, the tally of possible universes stands at the almost incomprehensible 10500, a number so large it defies analogy. For some string-theory advocates, this stupendous failure to yield a unique universe—ours—was a devastating blow. But to those advancing the multiverse, string theory’s enormous diversity of possible universes has proven vital. Just as it takes a well-stocked shoe store to guarantee you’ll find your size, only a well-stocked multiverse can guarantee that our universe, with its peculiar amount of dark energy, will be represented. On its own, inflationary cosmology falls short of the mark. While its never-ending series of big bangs would yield an immense collection of universes, many would have similar features, like a shoe store with stacks and stacks of sizes 5 and 13, but nothing in the size you seek. By combining inflationary cosmology and string theory, however, the stock room of universes overflows: in the hands of inflation, string theory’s enormously diverse collection of possible universes become actual universes, brought to life by one big bang after another. Our universe is then virtually guaranteed to be among them. And because of the special features necessary for our form of life, that’s the universe we inhabit. Years ago, Carl Sagan emphasized that extraordinary claims require extraordinary evidence. So, can we gather evidence supporting a proposal that invokes other universes? Because the other universes would lie beyond what we can observe, it might seem that the answer is no, placing the multiverse outside the bounds of science. But that’s too quick. Evidence for a proposal can be amassed even when some of its important features are inaccessible. Take black holes. Scientists routinely use general relativity to speak with confidence about what happens inside a black hole, even though nothing, not even light, can escape a black hole’s interior, rendering such regions unobservable. The justification is that once a theory makes a slew of accurate predictions about things we can observe, as general relativity has, we justifiably gain confidence in the theory’s predictions about things we can’t observe. Similarly, if a proposal that invokes the multiverse gains our confidence by making correct predictions about things we do have access to, things in our universe, then our confidence in its prediction of other universes, realms we don’t have access to, would rightly grow too. As of today, we are far from crossing this threshold. Inflationary cosmology makes accurate predictions about microwave background radiation; dark energy accurately explains accelerated expansion. But string theory remains hypothetical, largely because its primary distinguishing features become manifest at scales billions of times smaller than we can probe even with today’s most powerful accelerators. More direct evidence for the multiverse might come from potential collisions between our expanding universe and its neighbors. Such a cosmic fender bender would generate an additional pattern of temperature variations in the microwave background radiation that sophisticated telescopes might one day detect. Many consider this the most promising possibility for finding evidence in support of the multiverse. That there are ways, long shots to be sure, to test the multiverse proposal reflects its origin in careful mathematical analysis. Nevertheless, because the proposal is unquestionably tentative, we must approach it with healthy skepticism and invoke its explanatory framework judiciously. Imagine that when the apple fell on Newton’s head, he wasn’t inspired to develop the law of gravity, but instead reasoned that some apples fall down, others fall up, and we observe the downward variety simply because the upward ones have long since departed for outer space. The example is facetious but the point serious: used indiscriminately, the multiverse can be a cop-out that diverts scientists from seeking deeper explanations. On the other hand, failure to consider the multiverse can place scientists on a Keplerian treadmill in which they furiously chase answers to unanswerable questions. Which is all just to say that the multiverse falls squarely in the domain of high-risk science. There are numerous developments that could weaken the motivation for considering it, from scientists finally calculating the correct dark-energy value, or confirming a version of inflationary cosmology that only yields a single universe, or discovering that string theory no longer supports a cornucopia of possible universes. And so on. But as with all rational bets, high risk comes with the potential for high reward. During the past five centuries we’ve used the power of observation and mathematical calculation to shatter misconceptions. From a quaint, small, earth-centered universe to one filled with billions of galaxies, the journey has been both thrilling and humbling. We’ve been compelled to relinquish sacred belief in our own centrality, but with such cosmic demotion we’ve demonstrated the capacity of the human intellect to reach far beyond the confines of ordinary experience to reveal extraordinary truth. 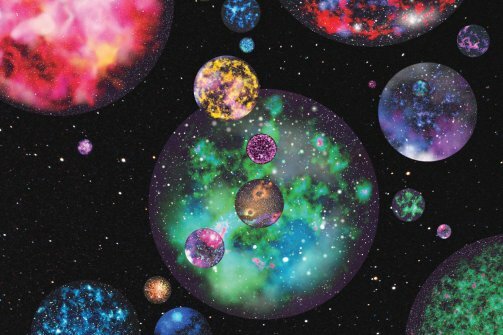 The multiverse proposal might be wrong. But it might also be the next step in this journey, unveiling a breathtaking panorama of universes populating a vast cosmic landscape. For some scientists, including me, that possibility makes the risk well worth taking.